Abercromby Chapter No 3699 of the Liverpool Group, have just held their annual installation ceremony at Liverpool Masonic Hall. 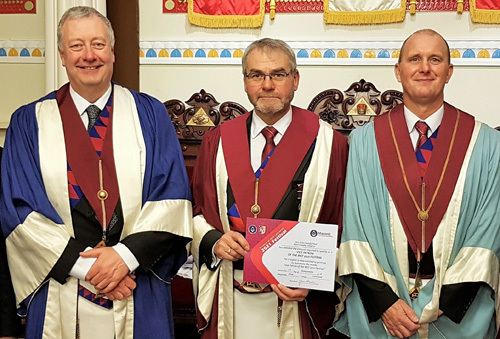 The principal guests for the evening being Peter Connolly as the representative of the Grand Superintendent, accompanied by the Liverpool Group Vice-Chairman David Kemp, with responsibility for the Royal Arch. After proffering a warm welcome to Peter and David, the installation ceremony was conducted in a well-paced, smooth and entertaining manner, ably supervised by the multi talented director of ceremonies John Roberts. Brian Kendrick did a great job of installing Barry Fletcher to the first principals chair, something which Barry had experienced previous in 2015. Barry then installed Andrew Beddeson into the chair of second principal in a similar professional manner. Sadly, third principal elect John Shaw, was unable to attend on the evening and will therefore will be installed at the next meeting. On the evening, David Byrne assisted the chapter by fulfilling the role of third principal. Barry then duly invested his officers for the coming 12 months and it was nice to see so many stewards appointed, boding extremely well for the future of Abercromby Chapter. Richard Wilson gave the address to the officers of the chapter, while David Kemp then gave the address to the companions. At the conclusion of the installation ceremony, Peter Connolly stood and brought the best wishes and greetings of the Grand Superintendent Tony Harrison, to the three principals, that they may keep busy, healthy and above all enjoy their Freemasonry. He then extended this to all the companions present. Peter was then presented with two cheques for the MCF 2021 Festival, for which he greatly thanked the chapter and in return he presented them with a certificate of ‘Vice Patronage to the Festival’, which he was very proud to do and which received suitable applause. Later at dinner, Peter brought his own greetings to the three principals and amidst some mirth, the gathering was entertained by his wit and humour. Peter expressed his absolute delight in witnessing Barry being placed in the chair of first principal again. He had known Barry for some time and greatly appreciated all the effort and endeavour Barry put into his position as a charity steward both within the Liverpool Group and West Lancashire Charities. He reiterated his earlier observation, that it had been an excellent convocation and congratulated Brian Kendrick for his prowess in the ceremony, as well as John Roberts in his role as DC and David Byrne for his part as third principal. Moving on, Peter updated the companions on the latest news and initiatives of the Province, including the MCF 2021 Festival and membership and offered his personal congratulations and admiration to Abercromby Chapter for achieving ‘Vice Patron’ status. With regard to membership, Peter commented on how enlivening it had been within the chapter to see so many new companions being given their first office. New members must be given plenty of encouragement, they need to feel they are involved, that way they will want to come to every meeting and feel an essential part of the chapter. In conclusion, Peter thanked the group officers for all their work and expressed his wish that Abercromby Chapter have a wonderful year. Overall, the evening was made special by all those who attended and this will no doubt continue in this very lively and enjoyable chapter. Pictured from left to right, are: Peter Connolly, Andrew Beddeson, Barry Fletcher, David Byrne and Brian Kendrick.